↑ Most popular during 2008; "Masada tourists' favorite spot in Israel". Ynetnews. अभिगमन तिथि 2009-04-08. . During 2005 to 2007 and 2009 to 2012, it was the second-most popular, behind the Jerusalem Biblical Zoo. ↑ Murphy-O'Connor, Jerome; Cunliffe, Barry. The Holy Land. Oxford Archaeological Guides (5th संस्करण). Oxford University Press. पपृ॰ 378–381. ↑ "The Yigael Yadin Masada Museum: Gift of the Shuki Levy Foundation". 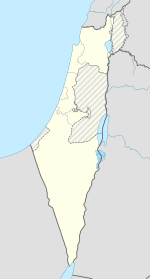 Israel Nature and Parks Authority. मूल से 2015-12-29 को पुरालेखित. ↑ "The Masada Museum in Memory of Yigael Yadin, Funded by the Shuki Levy Foundation". The Hebrew University of Jerusalem.